Although more testing is needed, clinical studies show an association between 100 genes and asthma. This fact gives researchers a lot to consider when conducting asthma clinical trials. It indicates that there may be a way to counter asthma before it becomes a problem. It means there may one day be a cure rather than simply treating asthma symptoms. If you or someone you know suffer from asthma please review our list of current asthma clinical trials. If you qualify you may be able to participate in a clinical trial to help us learn more about asthma, its causes and possible cures. Asthma is a chronic inflammatory disease of the airways. Symptoms of asthma include shortness of breath, tightness in the chest, wheezing, coughing, and trouble sleeping. Asthma is linked to a combination of genetic and environmental factors. Environmental factors include allergens such as smoke, dust, air quality, and pets. There has been a sharp increase in asthma since the 1970’s and as of 2009 over 300 million people worldwide are affected by it. Types of asthma include brittle asthma, asthma attack, status asthmaticus, and occupational asthma. Treating asthma is done best with a specific plan of management based on the patient’s symptoms. The easiest way to treat asthma is to avoid the triggers; however, this is not always possible. 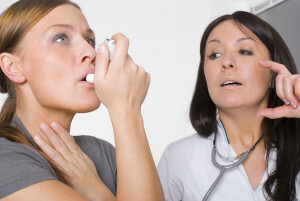 There are two main forms of medications used for treating asthma – quick relief and long term. Quick relief medications often come in the form of inhalers and can be used to provide fast relief in case of a flare up. Long term medications generally last 12 – 24 hours and aim to prevent asthma attacks. Unfortunately manual therapies such as osteopathic, chiropractic and respiratory therapeutic maneuvers have not proven effective. There is not enough evidence to support these as successful treatments for asthma.